Swedes did not play a major role in exploring or colonizing the New World, but they did establish the first permanent settlement in Pennsylvania. In 1633, the New South Company was formed by Dutch and Swedish investors to establish a commercial settlement in America. Under Peter Minuit's leadership, company agents purchased land from the Indians and built an outpost near present-day Wilmington, Delaware in 1637-38. The settlement was later moved to Tinicum Island (Philadelphia) where Johan Printz served as governor. Over the next few years, a string of small trading posts was established by Swedes and Finns along the west bank of the Delaware River. Dutch partners were bought out in the early 1640s, which left the company in Swedish hands. However, a trade rivalry developed between the two colonial forces. The Dutch took command of the area by establishing forts that would become Philadelphia, which effectively cut off the Swedish settlements from access to the sea. The rivalry climaxed in 1655, when a Dutch force led by Peter Stuyvesant of the New Netherland captured the Swedish settlements. Dutch control did not last long. The region was claimed and taken in 1664 by the English on behalf of the Duke of York. The Dutch briefly reclaimed the colony in 1673-74, but control again reverted to the more powerful English. The Swedish contribution to the establishment of American settlement was slight, but did offer the first use of the log cabin, a form of shelter that would become the standard of frontier life. 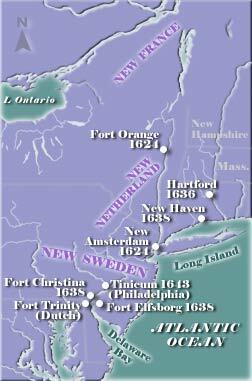 See the early history of the New Netherland and Pennsylvania . Names on the Land: A Historical Account of Place-Naming in the United States by George R. Stewart.